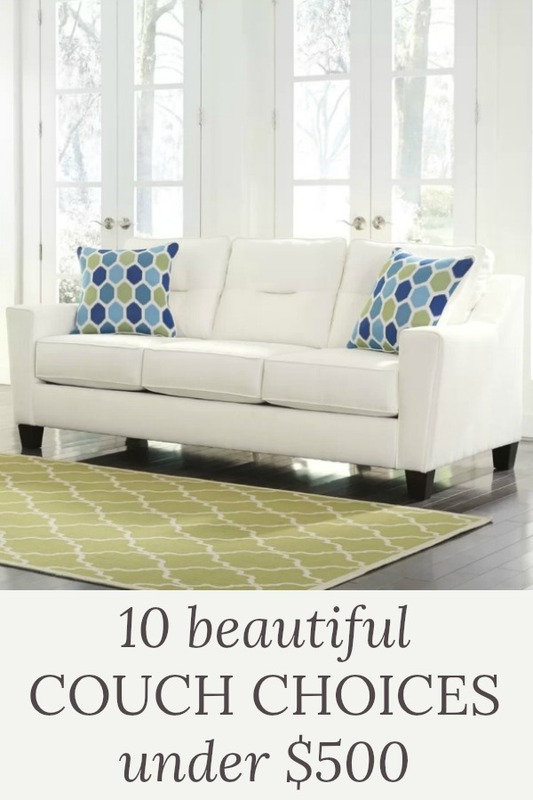 10 Beautiful Couch Choices Under $500! Finding a good looking couch for a great price, can be difficult. So, if you’re looking for a new couch, check out this list of 10 beautiful couches that are all under $500! I have couch envy. I really do. I look at the beautiful, neutral couches I see in stores, or in other blogger’s homes, and I’m a little envious. See, we have a very nice and expensive leather sofa, but it’s not very good looking. It’s extremely comfortable, but is also a honking big blue mass in our living room! You can see it in our home tour. It was picked out more for function than for beauty. So, I’ve had to decorate around it, which has worked OK, but I have to admit that sometimes I wish for a beautiful white couch! So, while I’m not currently in the market for a new sofa, and I can’t show you pics of a beautiful couch in our home, I can share my dream list of 10 beautiful couches that are all under $500! Those are my favorite couches! I know it can be frustrating to try to go from site to site every day to find home decor daily deals. So if you’d like to sign up for my FREE daily newsletter that showcases the best deals of each day, you’ll get my picks of the best home decor deals. Sign up below! « Craftsy Unlimited – Watch Craftsy Classes For FREE! Why are we all obsessed with white sofas? It’s all Joanna Gaines fault and now she is leaving us! Your selection is very nice, I especially love the nail heads. Because of our move this past year I was forced (dragging and kicking) to purchase a new sofa. Of course white was the only choice. Purchased ours from Ikea, with slipcover. Very comfortable and looks perfect in our den. However now I am afraid to sit on it. The first time I spilled some of my favorite cocktail on it. The spot came right out. As soon as we leave the house our very well behaved black furry dog jumps right up on her and makes herself comfy on top of all the pillows. So beware in purchasing your white sofa. Your “big blue” is looking very inviting! LOL! So true Kathleen! I think I like white couches because they go with the way I love to decorate. But I’m sure I would be afraid to sit on them too!